For some time scholars have debated whether the Song of Songs has connections to the wisdom genre and how this changes our understanding of it. 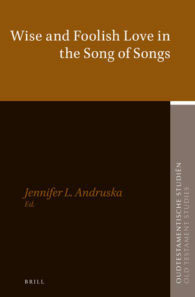 In Wise and Foolish Love in the Song of Songs, Jennifer Andruska shows that the influence of the wisdom genre on the Song is pervasive, running throughout the book, and offers an entirely new understanding of the book’s wisdom message. She demonstrates that the Song has combined elements of the ancient Near Eastern love song and wisdom genres to produce a wisdom literature about romantic love, inspiring readers to pursue a particular type of love relationship, modeled by the lovers throughout the poem, and aiming to transform them, through character formation, into wise lovers themselves.